Weight loss surgery is also known as bariatric surgery The term "bariatric" originates from the Greek words "baros", meaning weight, and "iatros", meaning medical treatment. Although bariatric surgery has been performed for many years, it has evolved dramatically since the days of the "stomach stapling" operations. The laparoscopic approach is a particularly significant innovation that is used in bariatric surgery today. Using this method, several tiny (1/4-1/2 inch) incisions are made. A small camera is used to view the inside of the abdomen on a TV monitor, and special small instruments are used for the surgery. The advantages of this minimally invasive approach to surgery are less pain, quicker recovery time, fewer post-operative complications (such as hernia and wound infection), and a better cosmetic result. All of the surgical procedures performed at the Weill Cornell Weight Loss Surgery Program can be performed laparoscopically. While the laparoscopic approach is often preferable, it is important to remember that in some cases it is necessary to perform surgeries in the traditional, open manner with a larger abdominal incision. Your surgeon will discuss the various options to determine the plan that is best for you. Using either the open or laparoscopic approach, surgical procedures for weight loss restrict the volume of food intake and/or cause some of the food to be less digested and less absorbed so it is eliminated in the stool. In some procedures, the size of the stomach is made smaller so that you can eat only a small amount of food at a time. In procedures that decrease absorption, a portion of the intestine is bypassed, so that food and digestive juices only mix together in a relatively short part of the intestine. With this method, less of the vitamins, minerals, and/or calories from the food you eat will be absorbed. 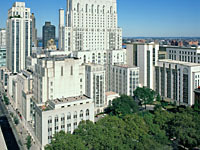 Four types of obesity surgery are offered at the Weill Cornell Weight Loss Surgery Program. To learn more about these surgical options, please click on the links at the left.